Do you have questions about new garage doors for your home or business? You are not alone! Purchasing new garage doors is an investment for your home and you want to make sure you choose the proper one for your home and needs. Read below some of our most asked questions, and answers to help make your purchase easier. How do I Measure for a New Garage Door? When you contact DoorTech Sudbury for your garage door, we will do all measurements for you. A standard lift door requires 12″ of headroom and a low headroom door requires 6″ of headroom. If the garage door is motor operated, an additional 2″ of headroom is needed. Standard garage door sizes for door widths are 8 feet, 9 feet, 10 feet, 12 feet, 14 feet, 15 feet, 16 feet, and 18 feet. What are the main garage door styles? The main garage door styles are roll-up, sliding, swing out and swing up. What material is best for my garage door? Depending on your budget, garage door materials will influence your purchasing decision. Wood composite is a lower cost material, is eco-friendly and you can paint on it. Custom wood is more elegant than wood composite but is more of an investment. Steel garage doors are inexpensive and a popular choice because of the cost. Steel doors do need more insulation, however. Vinyl is a great option because it is durable and some people like the look of it more than steel. How do I know if I Need a New Garage Door or Service? If your garage door isn’t working properly, that doesn’t necessarily mean you need a garage door replacement, you might need a repair call. If you aren’t sure if you need service for your garage door, or you need a total replacement, contact us and we would be happy to provide you with a free consultation. Do you have more questions about garage doors? We want to help! Please contact us today for more details on new doors for your home garage, or to ask any question you might have. 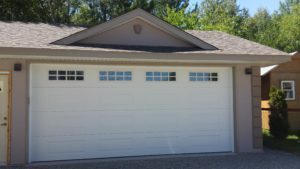 DoorTech Sudbury provides new garage door installation in Sudbury, Chelmsford, Val Caron, Lively, Garson, Timmins and Huntsville area. We also help homeowners and building owners by providing service and repair on garage doors. We are here to help you.